I thought I would write a few thoughts about fruit. Here in Uganda there are some delicious fruits available! Most fruit is fresher, tastier and less expensive here, at least the fruits that grow here. Not many apples, peaches, pears, grapes or berries in these tropical parts. But the pineapple is amazing! The bananas are our kids new afternoon snack. You can pretty much always find a woman with a basket of bananas on her head.And I love the mangos! And when you blend all of those into a smoothie, it is delicious! 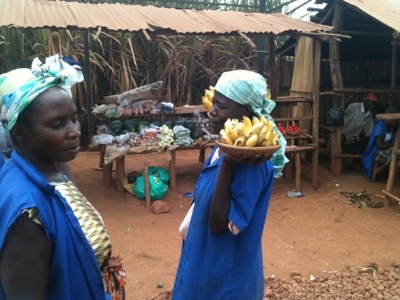 Below is a photo from Lugalumbo, the roadside market where we regularly stop for fresh produce. when you pull over, the women all run to your vehichle and put their produce in your window. There are other less familiar fruits here like Jackfruit which I have not tried yet, and my kids are not yet huge fans of the papaya. But the passion fruit juice is very tasty! The oranges here are actually green, they never ripen to an orange color and they are sour. There is also something the kids from the village just call "fruit." The missionary kids at GSF think it tastes bad, so we have not tried it yet. In our worship service yesterday, there was also discussion of fruit. There was an illustration about a mango tree, but the fruit that he was really talking about is the fruit of the Spirit. Galatians 5:22-23 "But the fruit of the Spirit is love, joy, peace, patience, kindness, goodness, faithfulness, gentleness and self-control." As we were listening to this sermon we were both convicted that we need to grow in these areas. So please pray for God to work the fruit of His Spirit into the lives of our family. Maybe when you see some bananas and pineapple at the store, you can remember to pray for our family that we would grow in love, joy, peace, patience, kindness, goodness, faithfulness, gentleness and self-control. Thanks for your prayers.